At Double H, we take the time to constantly analyse feedback from our customers to determine future product development. 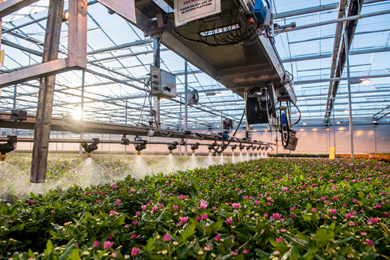 A system of weekly forecasting ensures high levels of availability of plants in peak condition for our customers. Every crop is tested in conditions that simulate transport, store and home environment, and the results used to adjust variety selection and growing techniques. At Double H we are proud of our established strategic commitment to sustainability which spans all aspects of the company. We are always looking for new and innovative transformational changes towards more sustainable processes. Our aim is to challenge ourselves and learn how to act differently to forge sustainable paths for the future. We see sustainability as an opportunity to inspire change for the good and value this ethos. Preferred use of biological methods for crop protection against pest and disease, rather than conventional chemically based methods. 95% of our heat use is generated from recycled wood rather than fossil fuels. Separation and recycling of all waste (zero to land fill). Sealed watering systems that eliminate waste of water and nutrients. As part of the community we recognise our responsibility to care for the internal, local and global environment. We are committed to meeting or surpassing the requirements of all environmental law that applies to our business. Our principle customers are major supermarket retailers and we aim to assist and support them in leading the development of more environmentally conscious production with particular emphasis on energy efficiency, peat reduction, pesticide reduction and waste recycling. Furthermore we will strive, wherever practical, to minimise the negative and maximise the positive environmental impacts of our activities through the introduction of management systems that will promote continual improvement. We firmly believe in planning for long term business success as evidenced by: Lean manufacturing, Investors in People, Biomass Energy Production, Re-investment in new growing facilities. We have won a number of awards in recognition of our sustainable approach to business. Double H are proud to announce the completion of our new Rose greenhouses. The development will also create a new entrance, reception area and loading bay. The fresh and modern design of the new building development will integrate new office space to house a professional creative suite and workshop facilities, along with a state of the art photography room and product display centre.